NORTH EASTON, Mass. 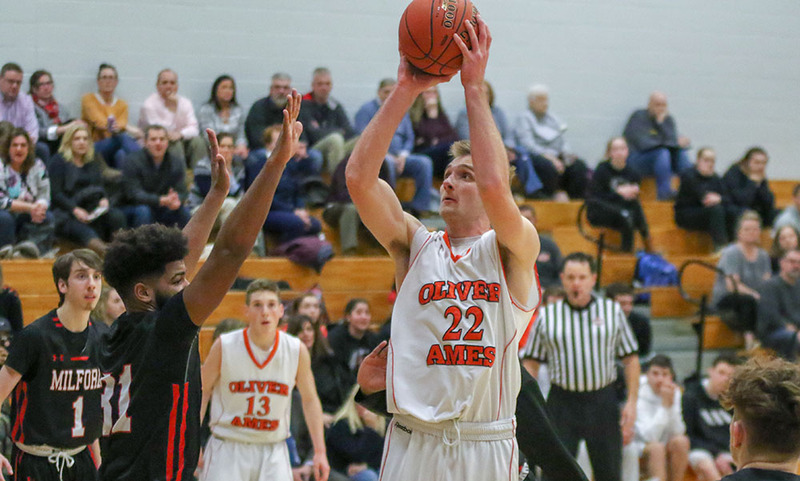 – Behind a fast start, a strong finish, and key contributions off the bench, Oliver Ames boys basketball picked up a crucial win over Milford on Tuesday. The Tigers came out flying in the opening quarter and built a double-digit lead, but needed a strong fourth quarter after the Hawks got within one possession entering the final frame. And on top of that, Oliver Ames’ bench combined to score 23 points, including 11 in the crucial final quarter. While Oliver Ames had an 18-5 lead after one, and a 26-15 lead at halftime, the Scarlet Hawks made it a close game with a big third quarter. Milford outscored the Tigers 19-11 in the frame, including four points in the final seconds to make it a one-possession game at 37-34. A questionable bench technical on Milford gave OA two free throws to begin the final quarter, and senior Michael Greene (career-high 10 points off the bench) gave the Tigers a bit of breathing room by hitting both. After getting a stop on the defensive end, Greene sank a three to put Oliver Ames up 42-34. Milford got within four behind back-to-back buckets from sophomore Dom Schofield (seven points, five rebounds) but OA senior Sean O’Brien drained a three off a feed from Greene to push it back to seven. Greene came up with a steal on the next possession, which led to a fast break and two made free throws from senior Ethan Eckstrom (nine points, 11 rebounds) and a 47-38 lead with under five minutes to go. Junior Owen Friel (four points off the bench) extended OA’s advantage to 11, a lead that the Tigers held for the majority of time left in the game. Friel and Greene each added two more in the final minutes. Greene and Friel were joined by junior Ryan Burkett (five points, four rebounds) and sophomore Amari Brown (four points, three rebounds, three assists) as key contributors off the bench for OA. The four combined for 23 points. Oliver Ames’ defense limited the Hawks to just 2-for-13 shooting in the opening quarter and Milford settled for a couple of contested long threes (1-for-9 in the period). Brown came off the bench and scored four points in first, Eckstrom had four in the first along with eight boards, and four other Tigers were on the scoreboard, including a late three from Greene. Milford switched to a zone in the second and that seemed to slow the Tigers down a bit, limiting OA to just eight points in the frame. Milford had a 7-0 run to start. The second to get within six but only scored three points the rest of the way and entered halftime down 11, 26-15. Scarlet Hawks senior Brendan White took over in the third quarter. Fresh off his 40-point performance against Stoughton on Friday, White poured in 14 of his 19 points in the period to help get the Hawks in the game. In the final seconds of the third, White converted a layup and then stole the inbounds pass, quickly putting the ball up for two more to beat the buzzer to make it 37-34. Milford’s bench celebrated by walking onto the floor to greet White but was hit with a technical foul. Oliver Ames boys basketball (4-5 Hockomock, 6-5 overall) is back in action on Friday when it hosts King Philip. Milford (3-6, 4-8) is also home on Friday night and will entertain Davenport rival Canton.